Snippets of Jack: "Mr. Cotton! Answer Me"
You know we haven't really made many posts on Jacks loyal crew. Oh, they would do anything for Jack. Today I'll talk about Cotton. 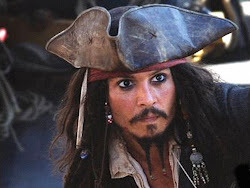 We first meet him in Pirates of the Caribbean: Tales of the Code: Wedlocked. In this film the Pirate Code is shot. The man who shot it threatens to cut out anyones tongue if he/she told on him. Of course Cotton being the awesome code-abiding person he is tells Teague. Well you can probably guess what happens next. Cotton now has no tongue. After becoming tongueless Cotton somehow manages to teach his parrot to talk for him. Again, amazing! Cotton eventually makes it to Tortuga, and is recruited by Captain Jack Sparrow along with the rest of the motley crew to work aboard the HMS Interceptor. We all know that Gibbs and the rest of the crew left Jack on the Isla De Muerto, taking the Black Pearl with them. But in the end they realize the the code is more like guidelines . . . ironic considering how Cotton lost his tongue. Later when Jack comes back after visiting a turkish prison with no treasure Cotton being the good pirate he is wants something shiny, but agrees to wait a little longer. After being confronted by Bootstrap Bill about the kraken the crew is ordered to make sail to the nearest island, Isla Pelegostos. Cotton is inprisoned in the bone cage with all the good crew mates like Gibbs, Marty, and later Will Turner. Cotton helped them climb up the cliff and roll away from the evil tribesmen. He and the others make it back to the Pearl and sail to Tia Dalma's hut as fast as they can. During the trip there Gibbs explains to the crew about this mysterious woman. So when they get there everyone wants to check it out. Gibbs to Jack: "I'll watch your back." Jack: "It's me front I'm worried about. Mind the boat." Gibbs to Will: "Mind the boat." Will to Ragetti: "Mind the boat." Ragetti to Pintel: "Mind the boat." Pintel to Marty: "Mind the boat." 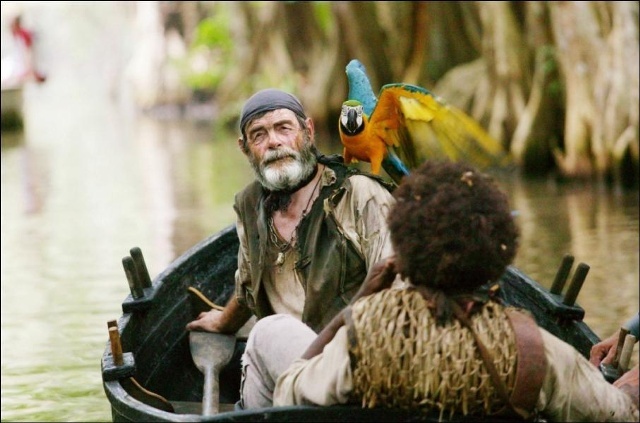 Marty to Cotton's parrot: "Mind the boat." Cotton's parrot to Cotton: "Caaaaahh! Mind the boat." Poor Cotton slumps back in the row boat upset seeing there is no one else there. Meanwhile inside the hut Tia Dalma gives Will the heading to the Flying Dutchman in exchange for Barbossa's undead monkey. So the crew sale to where the Dutchman is. Will goes to what he thinks is the Dutchman but is really a ship destroyed by the kraken. Jones' and his crew capture Will and appear a board the Black Pearl and capture the unsuspecting crew, including Cotton. Luckily Jack works his magic and frees the crew. Unfortunatley Jack's magic included finding 100 men to give to Davy Jones. So what better place to find 100 desperate sailors then Tortuga? They realize that, even in Tortuga, they can't find enough stupid people after James Norrington attacks them. They change they're tactics and decide to destroy Jones and take his ship. However that doesn't work so well because James takes the heart required to kill Jones and gives it to Cutler Beckett. Jones sends his pet the Kraken after the Black Pearl and it kills Jack, thanks to Elizabeth. The crew escape and go to Tia Dalma, and this time Cotton meets her. She convinces them to go to World's End with her and Barbossa in order to save Jack from Davy Jones' Locker. But first they must retrieve the map to the Farthest Gate from Pirate Lord Sao Feng. However during they're meeting the EITC attacks them. They escape with the maps, a crew, and a Ship. After getting lost they fall into the Land of the Dead. 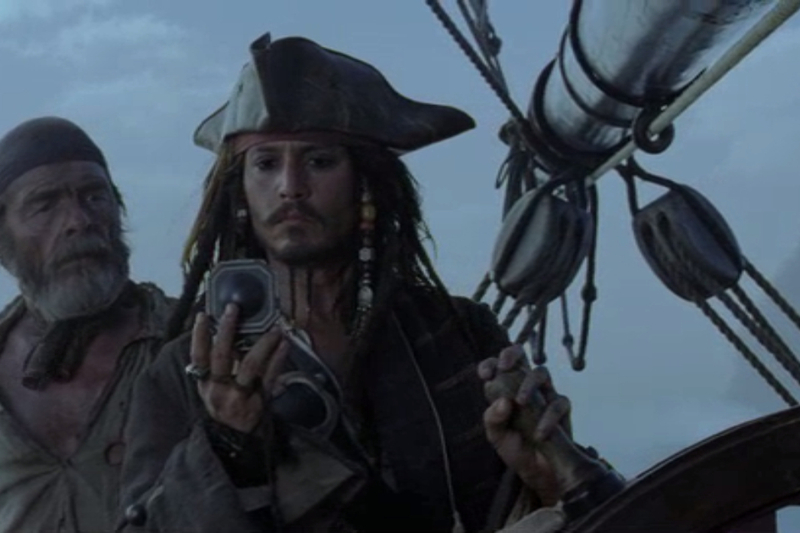 Jack appears with the Black Pearl and they "sail" out of the Locker. Once back on Earth they are confronted by Sao Feng and Cutler Beckett who intend to take the Black Pearl. Barbossa convinces Feng to stop helping the EITC and help the Pirates. They split up and meet back up at Shipwreck Cove with the Pirate armada. You know happens next, the pirates kill Jones, Beckett, and the EITC armada retreats. Sadly Cotton and the rest of the crew did not go On Stranger Tides.